Nigeria has come a long way when it comes to financial inclusion. We have gone beyond digging holes in bedrooms to bury money to keeping money in the bank. According to the Global Findex Database report by the World Bank, only 40 per cent of Nigerian adults have bank accounts. Sadly, the same report says that 118 million Nigerians do not have bank accounts. This means there is still so much to be done to boost financial inclusion in Nigeria. What is financial inclusion? It is where individuals and businesses have access to useful and affordable financial products and services that meet their needs that are delivered in a responsible and sustainable way. Financial inclusion is defined as the availability and equality of opportunities to access financial services. It is therefore essential to note that every Nigerian notwithstanding whether they are residing in the rural or urban area must have access to useful financial products and services which can in turn help in tackling and reducing poverty. In this case, the Central Bank of Nigeria is employing different strategies to ensure that every Nigerian is banked. One of such strategies was to set up along with stakeholders the National Financial Inclusion Strategy on 23rd October 2012. The NFIS is aiming to reduce the exclusion rate to 20% by 2020. Specifically, adult Nigerians with access to payment services is to increase from 21.6% to 70% in 2020, while those with access to savings should increase from 24.0% to 60%; and Credit from 2% to 40%, Insurance from1% to 40% and Pensions from 5% to 40%, within the same period. Meanwhile, the private sector is also making efforts to drive financial inclusion. 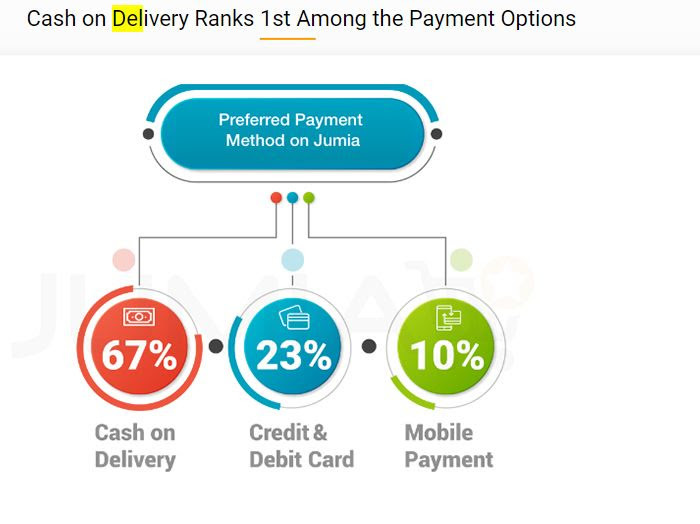 Although Pay on Delivery rank first among the payment options when it comes to Jumia, 33% of Nigerians pay for transactions using credit/debit card or mobile payment. Pay on delivery stands at 67%. This is according to the Jumia Mobile Report. Clearly, If you do not have a bank account, you cannot perform such a transaction. And Jumia has thousands of customers both in the rural and urban areas. Undoubtedly, Jumia has made significant contributions to accelerate financial inclusion. The vigorous attempts are actually paying off and quite an appreciable number of Nigerians have joined the financial inclusion race. This has been largely complemented by technology. As you know, technology has a solution for almost every social problem if properly deployed. Despite the fact that the minimum wage in Nigeria is 18,000 ($50), 23.6% of the adult population earn less than $2 per day and 10.9% of adults have no income. As such, this Nigerians will not see the need for any financial services and unfortunately, saving is not an option for them. and 79% of rural dwellers are unbanked. This is why most of the financial inclusion efforts are usually focused on rural areas. financial institutions and products. It is further exacerbated by the fact that there is a lack of trust in the banking system. This is perhaps why an average person will prefer to keep their money under their bed instead of the bank. This is another hurdle of financial inclusion. Some persons cannot afford ATM fees/cards/transactions and minimum balances required to open an account. Also, the documentation process may be cumbersome. Like earlier mentioned, technology has a solution for every social problem if exhaustively tapped. For financial inclusions, fintech startups are springing up almost on a daily basis. Some of these fintechs are payment gateways, others are loan oriented and another set is purely informational. Even though the banks are doing their bit by having branches in the nooks and crannies of the country, the fintechs are disrupting the financial space because they are using tech to provide viable financial products. Today, a woman in the village can approach a loan-oriented fintech for loan and within 48 hours, she will receive an alert. Of course, one of the criteria is to have an account. This will not happen with a Nigerian bank. Additionally, Jumia provides credit facility to its vendors to enable them to do business effortlessly. Furthermore, the proper location of ATMs is critical to financial inclusion. ATMs should be strategically located and interestingly, you can use Google map to search for the ATMs. Ultimately, if financial information is provided to Nigerians, it will definitely boost financial inclusion. For example, almost everyone in both the rural and urban areas owns phones, text messages can be sent in their local languages to make them understand the financial services available to them. This will definitely help accelerate financial inclusion and ensure that the NFIS target is actualised.